This was a better than average opener. The three women went for a series of pinfall attempts right from the start, then they moved on to some double-teaming. Kid and Nakano both had some moments when they dominated, though this match was pretty even throughout. The best part was probably Kid’s double Muta Lock on both Nakano and Shibusawa at the same time. She should have kept the hold on longer, but it was fun while it lasted. Good match. Brookside with a lot of hard strikes, and she seemed to be ahead of Tora throughout much of the match. Tora had a string of offense in the middle of the match, but Brookside survived the onslaught and fought back with her superior speed. This was a solid match, though I never really felt like Tora was going to take the title from Brookside. Good match. Priestley and Watanabe started the match by exchanging some hard kicks, and that set a good tone for the rest of the match. Every woman had a few moments to shine. It ended up with Shirai and Rose in the ring. Rose used her power to get some early offense on Shirai, but Shirai’s tenacity, brains, and agility allowed her to quickly come back and dominate Rose in the end. Very good match. Savoy dominated the early part of this match. She was so in-control of Kyona that it seemed like Savoy didn’t take the match very seriously after a while. Kyona persevered despite the pain, and she began to mount a comeback that was rather impressive. This was a very hard fought match, and Kyona managed to win a lot of respect from Savoy (and probably a lot of fans). I really enjoyed this and would definitely watch it again. Pretty good match. I would say this was practically an exhibition for Storm. It took Miranda quite a while to get going, and even when she did get a little offense, it never felt like Storm was in trouble. This was Miranda’s last match on her tour with Stardom, so this was possibly a way for the company to thank her for her work. It was definitely her most high profile match in Stardom. Good match. This was Mimura’s last match in Osaka, so she became the focal point near the end of the match. The best part for me was the fight between Kagetsu and Iwatani though. They hit hard and moved very quickly against each other. Out of this entire match, what I really want to see come out of it is a singles match between Kagetsu and Mayu Iwatani. This was an entertaining show. It easily felt like a more important show than the daytime event earlier the same day. 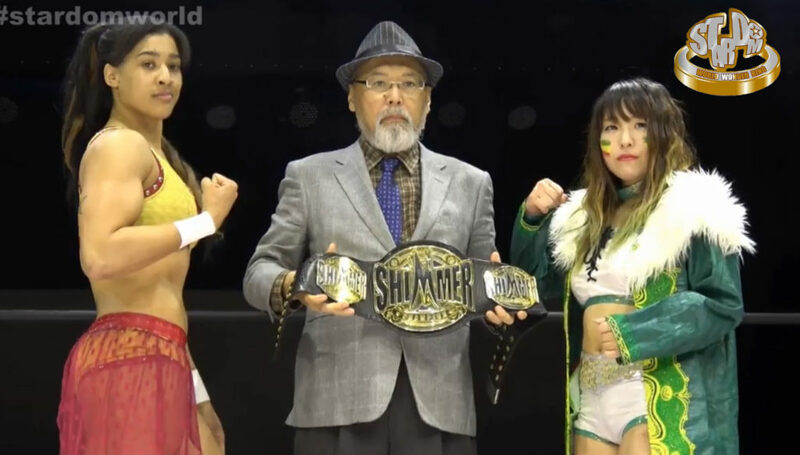 The title matches were mostly good, and the main event was fun. This was the best match in my eyes. The struggle that Jungle Kyona went through was very engaging.